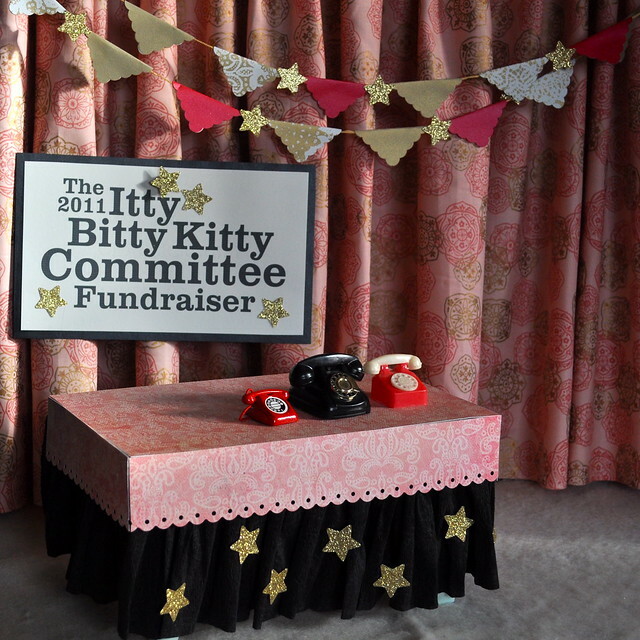 The Itty Bitty Kitty Committee: A Sneak Peek!! The Dearborns are in training, and will be ready to take your calls on Monday!!! You are so creative and clever! I can't wait to see those tiny cuties at work! So pretty. I'm sure the Dearborns will look even cuter in it. That is, quite honestly, the most ridiculously adorable set-up I have seen. Well, sans cats anyway. OMG, the teeny tiny little pennants!!! I can't wait to see the damage the kittens wreak upon it. soo adorable! can't wait to see more! Too cute to live in a house! That color will set off the Dearborns quite nicely, espeically Sheldon! Do we have a goal for this year? And what might the end result at the shelter be? How many squillion will Charlene raise this year? Come on, IBKC'ers, we can't let The Bean down! Laurie, you're killin' us. So adorable and so silly!! Perfectly made. Just too wonderful for words. I give those pretty little pennants five minutes of survival with kitties around. I love it! I hope the Dearborns don't trash the place like the Suprenant girls did last year (that post still cracks me up). Fantastic! The best one yet! Every year it gets better....! I can hardly wait to experience the phone staff! You're going to have to dig up the Darling footage and run it for Sheldon so he can pick up some tips from Hubie-doobie-do on how to work the audience with his dashing handsomeness and charm. EVERY time I think about the fundraiser I think about how you found it trashed last year. That is worth a re-post for all the newbies... My check book is waiting... Oh yeah, lovely job on the remodel Of course the picture on the blog, not sure who the operator is that is standing by, always brings a smile to my face. That is why the $$ here in Florida end up on the west coast at this time of year. IBKC brings me much joy through out the year and sometimes, words are just not enough. I have never done a telethon IBKC style before, and am looking forward to it. Do you arrange them around the most gorgeous litter? Or is this just coincidence? ps - I hope this year there's another day of donations for the "Drewey Fund." My best kittie friend ever was a senior cat, and I loved being able to give knowing it would go to helping the older "babies" get adopted!!! Thank you Laurie for all your kind work. I second Sarah on the senior day! I adopted a 14-year-old just a few months ago and while the itty's are simply adorable, there's something utterly amazing about being able to offer a peaceful and comfortable retirement home for a loveable senior. OK..I jumped the gun and posted about this upcoming event on my blog....cause you knew I would. That is darling! Would love to see a scale picture of it so we can see how really tiny it actually is....Precious! I think it's the teeny tiny phones that slay me every time. Where on earth did you ever find such perfect essential items for the kitties? It WAS those Suprenant girls who made like rockstars on the set, wasn't it? Champagne bottles everywhere, potted plants uprooted, room service trays smashed, furniture gnawed on. Of course, Mike and I are very proud. Outlaws, they were. Outlaws. Love the Drewey fund and the whole darned thing. Woot! Let's GO!!! The new set is absolutely adorable! I can't wait to see the babies in it. Hee hee, yeah, I remember the Kittens Of Mass Destruction from last year! P.S. To Anon in Florida: that cute little operator is Selma Darling. I'm excited that the Dog-A Thon is just around the corner. Last year was my first year and, quite frankly, IBKC kicked some doggie backside when it came to fundraising. This group raised a huge amount of money but what truly touched my heart was the contribution of little Opal. For those of you who are new, here is a link to her contribution story. If we ever need a reminder of what can be achieved, check out how generous and inspiring little Opal was. Sam - Yes, there is a goal and I'll be announcing it on Monday! Stay tuned! G- MANY I am sure! There's so much enthusiasm already!! Burnttoast - It's all built around Dog-A-Thon, the big fundraiser for our Humane Society. Laura - I love small things, and the phones have been in my possession for years. Yep, Cynthia. Those girls trashed the joint!